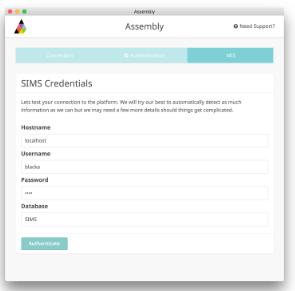 Please note you will need Administrator privileges on SIMS to manage user accounts. Go to Focus -> System Manager -> Manage Users and click New. Enter the surname "Assembly" and the forename "User" (you do not have to enter a gender or date of birth). Click Continue. Ensure that the username is "Assembly.User" (you may have to manually change this, depending on your username settings). Make a copy of the autogenerated password. If you manually create a password for the user, it should only use alphanumeric characters (no special characters such as * / <). Ensure that the active tick box is selected. This is an important step that ensures the user has sufficient access to pull information into the platform. Once the user has been placed in the relevant groups, click Save to complete the process. You can now enter the SIMS Username and password in the SIMS Credentials area of the Connector setup.